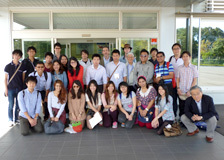 Together with the Local Community | CSR | MURAKAMI CO., LTD. 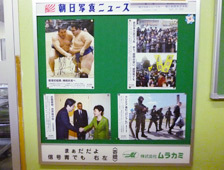 In order to cherish our connections with the local community around our business offices, including our headquarters, production bases and sales offices, as well as to become a company that is trusted as a corporate citizen, at Murakami we contribute to the local community from a variety of perspectives such as through supporting local celebrations. We also provide photo news to neighboring elementary schools. 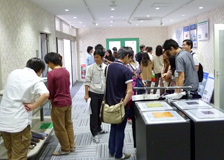 Screen printing is not only used within Japan, but it is employed widely in all locations around the world. At Murakami, we are actively carrying out global interactive activities in order to send out the advanced knowledge we have cultivated in the field of screen printing to the world. The first instance of such activity took place in 1981. We visited China upon invitation from the China Research Institute of Printing Science and Technology and held a technical seminar there. In addition, we have contributed to the spread of screen printing and technological improvements in China through initiatives such as inviting members of the research institute to Japan and conducting technical instructions. In 2013, at the “Electronic Materials Symposium” organized by the Japan-China Science and Technology Exchange Association and Chinese Academy of Sciences, we gave a lecture to students from various universities, including Tsinghua University, Peking University and Shanghai Jiao Tong University. 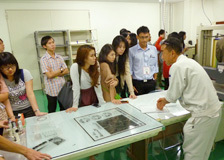 Furthermore, in response to a request received from Chiba University, we invited foreign students from Thailand and Malaysia, and we lectured on an overview of screen printing as well as held workshops such as plate making and printing demonstrations. Going forward, we will continue to contribute to the spread of screen printing technology through various overseas interaction.